Thinking about starting a Facebook Advertising? You need to know, many people fail. Why? They don’t understand the subtleties of the platform. Don’t worry, we will cover everything you need to know for successful Facebook advertising in this post. But Facebook has its own set of rules and steps to follow to ensure your ad’s success, and if you’re not familiar with the platform, it’s easy to get overwhelmed. That’s why in this guide I cover all the in’s and out’s of Facebook advertising: why you need it, how to set it up, and how to make sure it’s the right move for your brand. Advertising on Facebook is one of the most effective ways to reach your audience. The channel boasts 1.13 billion daily active users, which means more than likely, your audience is using it as well. While that’s great news for brands, the problem is that Facebook has made it increasingly difficult for brands to reach that audience through organic posts. New algorithm updates on the platform have been designed specifically to focus on more meaningful interactions and engagement in user’s newsfeeds – in a nutshell, it means users will be seeing fewer posts from brands and businesses. In 2016 alone, publishers saw a 52% decline in organic reach on Facebook. Whomp whomp. The silver lining? 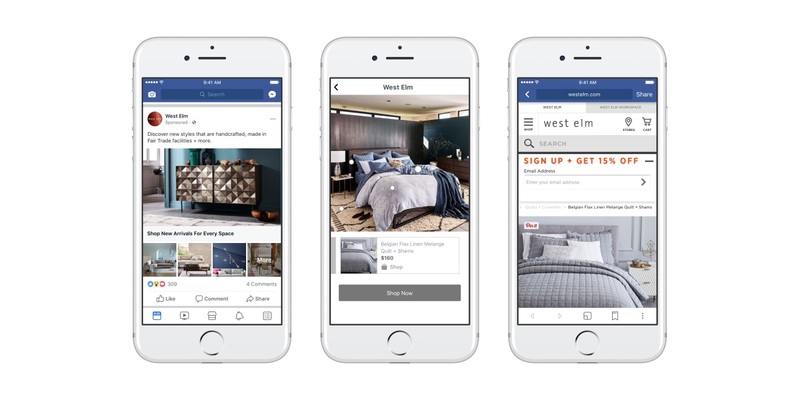 Facebook advertising is more alive and effective than ever. Advertising of any kind is a commitment, no question there. So before diving in, brands understandably need to know: is it worth it? Facebook advertising can help you grow your business and customer loyalty and effectively pinpoint quality leads. First of all, it works for businesses across the board. Facebook is the top ad channel for both B2C and B2B marketers; it’s the #1 choice for 72% of B2C’s, and 43% of B2B’s – surpassing even LinkedIn. Your customers are willing to support you on the platform – 49% of users like a Facebook page to support their favorite brands. This is by no means an exhaustive list, but I think you get the idea. By now, you’re probably eager to get the ball rolling on your first Facebook ad. Your business goal – what are you trying to achieve with your goal? Your target audience – who are you trying to reach with your ad? A campaign budget for your ad – how much are you willing to spend over the duration of your ad campaign? Your ad creative – what photos, videos or text will you use in your ad? To better decide on the above, you need to be familiar with all the options available to you regarding objectives, audiences, and ad types. This is the first step of running your campaign – as well as the first step in the set-up process. Which Facebook advertising objective should you choose? Engagement – This option promotes engagement in the form of page likes, shares, comments, etc. Once you’ve established your overall objective, your next job is to consider your audience. This is where Facebook really shines. For each campaign, you’ll be prompted to target a specific audience. Location lets you include or exclude people based on their location. Of course, it isn’t quite as simple as that. Then you’ll add your location, and specify the exact radius you’d like to reach. You’re not limited to just one location; choose as many as you’d like and repeat the process. For age, you specify a minimum and maximum age to show your ads to. For gender, you select between Men, Women, and All. For language, you can specify a language or leave it blank. This one allows you target your audience based on their interests and hobbies. These could be anything from horror movies and video games to sports and outdoor activities. This option digs into specific behaviors and lets you target users by activities like previous purchase behavior, device usage, homeowner status, etc. The last option is to target people based on their interactions with your Page or app. You can choose to target people who like your page or friends of people who like your page, as well as people who use your app and friends of people who use your app. You can also choose to exclude people who like your page or use your app to target an entirely new audience. In addition to creating your own core audience, Facebook gives you the option to target an audience you’re already connected to. If you’re using a contact list for your custom audience, you can upload your existing list to Facebook. To build an audience based on your website visitors, you’ll first need to install the Facebook pixel. The pixel is a snippet of code that you will create in Facebook and add to your website. To target based on your mobile app users, you can select one of your connected apps and install the Facebook SDK on the app. Much like the Facebook pixel, you can then choose segments of your app audience to track. 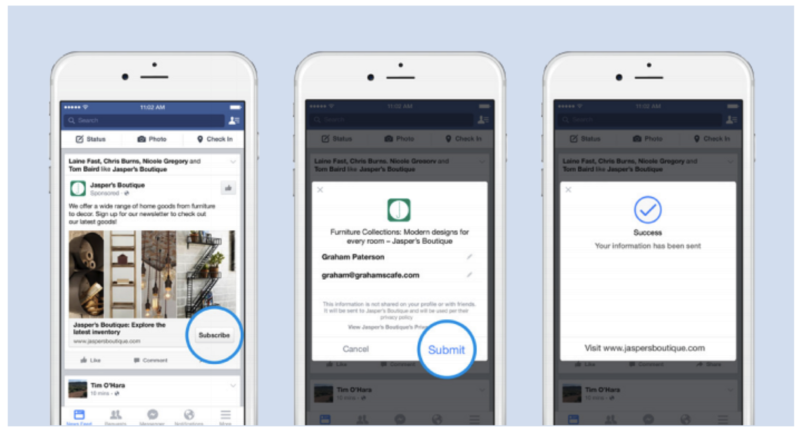 Custom Audiences allow you to use Facebook retargeting tools, a particularly powerful way to target customers and connect with those who have already shown interest in your brand. Lookalike audiences allow you to target people on Facebook who are similar to an audience you’ve already created. Using this option will increase the likelihood that your ad will reach people interested in your business, based on their similarities to your existing customer and prospect base. As you get more familiar with Facebook advertising, you’ll be able to experiment with the different types of audiences and find which produces the best results for your brand. When creating your audience, remember to keep an eye on the meter just to the right side of the screen. This will gauge the size of the audience you plan to target, and how many people you can expect to reach on a daily basis. The next step is deciding how much you’re willing to spend on your campaign. Here, you’ll the option to choose between a daily budget and a lifetime budget. If you choose the daily budget, you’ll enter the maximum amount you’re willing to spend per day. If you choose the daily budget, you’ll enter the maximum amount you’re willing to spend over the duration of your campaign. This also requires that you select and start and end date for your campaign. Before we move on to the next step, let’s take a deeper look at Facebook’s bidding system. The ad with the highest total value ultimately wins the auction. The takeaway here is that your ad’s ability to win an auction isn’t tied exclusively to the amount you’re willing to spend, but to the overall quality of your ad. Finally, you’re able to choose the format of your ad. The format you choose will ultimately be tied to the campaign objective you chose, and you’ll notice that some formats aren’t compatible with certain objectives. 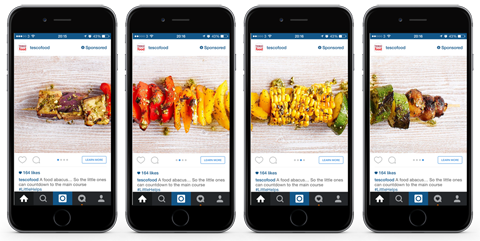 Just like it sounds, photo ads feature a single image and with a small amount of text. When creating a photo ad, you’ll have the option of uploading your own image or choosing from Facebook’s stock images. Video ads are one of the most popular options for advertising; after all, Facebook users on average watch 8 billion videos per day. With number’s like that, it’s easy to see why so many marketers are giving video ads a try. Carousel ads allow you to show up to 10 images or videos (called cards) within a single ad. Slideshow ads are much like video ads, but created from up to 10 still images. 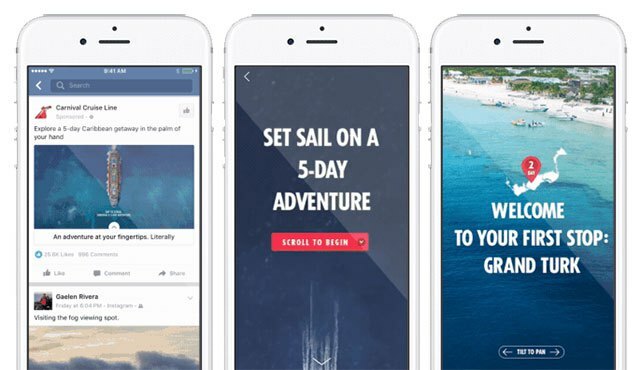 Facebook created slideshow ads to allow advertisers to capture the power of a video ad – without the time and expense associated with it. 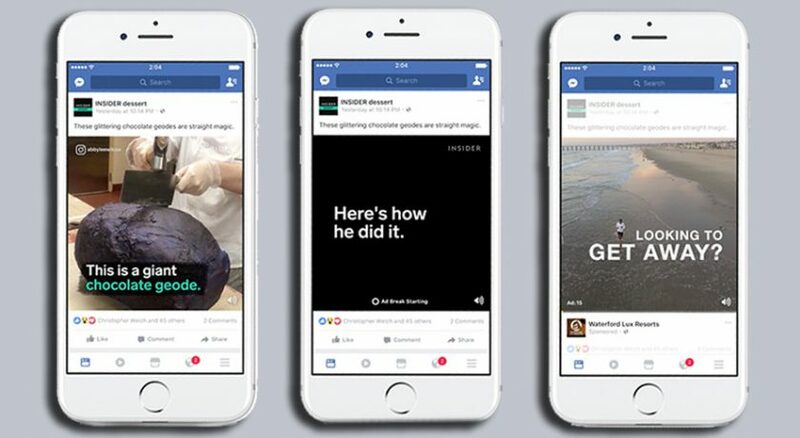 To make things even easier, you can pull images from Facebook’s stock library or existing videos. A collection ad lets you combine an image, video, or slideshow ad with a row of 4 thumbnails underneath it. It’s ideally suited to retail, as people can browse through multiple products in one ad. They first appear as regular photo ads, but when clicked on expand to a full-screen, fully-immersive experience that can include up to 20 images. Lead generation ads are designed specifically to capture lead information. You can present the ad through image, video, or carousel format. The ad will be followed by a lead form for the user to fill out. You create and choose which fields you would like filled out, and based on a user’s profile Facebook will auto-populate some of the fields for you. The requirements are the same as with regular photo, video or carousel ads. Make sure to include a clear value proposition – why should they share their information with you? So, What’s the Best Way to Advertise on Facebook For My Brand? That all comes down to what your brand does, and what it’s trying to accomplish. Run an e-commerce company? You’ll want to focus on promoting your products and driving leads to your product pages. That means you’ll want to focus on conversions and showcase your products through carousel and canvas ads. Maybe your business is more service-oriented. You’ll likely want to advertise case studies and customer testimonials to promote social proof. You can do this effectively with video or slideshow ads and focus on broader objectives like reach and engagement. The most important thing is to really analyze what kind of business you have and which ad types and campaigns will best suit what you have to offer. Of course, no ad campaign is complete without a way to measure its performance. But Facebook has you covered there, and offers a comprehensive overview of each campaign’s analytics. Your analytics can be accessed through your dashboard, and can be measured by ad sets (a collection of ads in a particular campaign) or specific ads. You’ll be able to access the stats for key metrics including delivery, reach, results, and relevance score. To ensure the best results, Facebook also allows and encourages A/B testing. Also known as split testing, it allows you to test two or more version of an ad to a similar audience in order to see which performs best. Common variables to test include your ad creative, placement, audience, and delivery. I highly recommend running tests to ensure your ad is reaching and resonating with your target audience. So you know what to look for, but how do you know what numbers to look for? Especially for those just starting out, it can be extremely difficult to tell how well your ads are performing. The truth is, the results will vary widely by industry, timing, and a number of other factors. The best way to truly interpret your ad’s performance is through time and practice. Again, these are only averages, and the best way to truly know what works best for you is through performance over time. But these averages will give you an idea of the numbers you should be working towards – and hopefully, exceeding. There’s a lot of ground to cover when it comes to advertising on Facebook. The good news is, once you’ve mastered the factors like objective, audience, and ad format, setting up your ads in the future will be a cinch. If you need help, let us know.